In the past, guests used to visit family houses and eat roasted goose there. Housekeeper welcomed guests usually in the front room, nowadays called living room. For many families, it has been a nice upgrading to the family budget, which was particularly suited before Christmas. The front rooms have later grown into the back parts of the house, and nowadays these are more or less the restaurants, although many with limited services. Slovenský Grob is part of the Little Carpathian wine route. Goose goodies are prepared here according to the traditional recipes that are the tradition of local families. The basis is honestly reared domestic goose prepared in clay pans, thanks to which the meat gets the right smell, color and especially taste. “Lokše” are served to the goose meat larded and staffed. Some people tend to eat “lokše” independently with jam and poppy. Stormy wine called “burčiak” or local wine inherently belong to a tasty goose meat. Other popular family businesses can be found in villages such as Slovak Grob, Svätý Jur or Limbach. 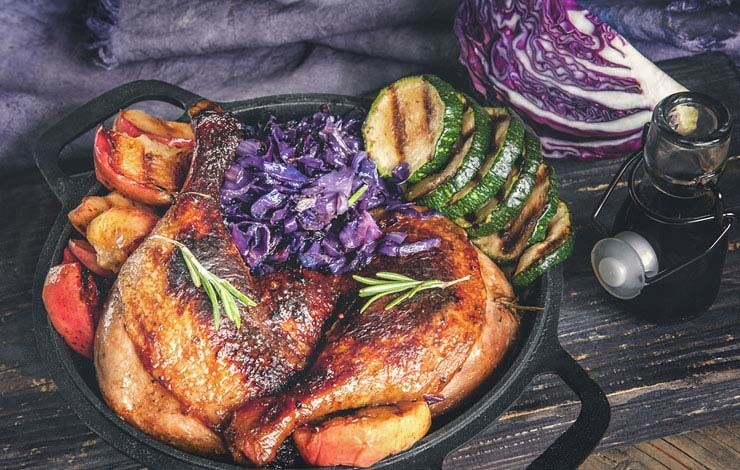 Also in many Bratislava restaurants, they have prepared special events and offer goose and duck feasts in their premises to order.